Saudi Arabia's King Salman has sacked a senior aide, days after he was filmed appearing to slap a photojournalist. No reason was given for the removal of Mohammed al-Tobayshi as head of royal protocol in a decree published by the official SPA news agency on Tuesday. But TV footage seemingly showed Mr Tobayshi hitting the photographer while King Salman greeted Morocco's King Mohammed at Riyadh airport on Sunday. 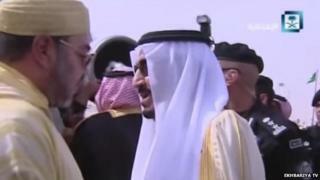 The king's decision was welcomed by Saudis on social media networks. After the video was posted online, many had accused Mr Tobayshi of abusing his authority. "This is a great day for journalists and media figures," journalist Abdullah al-Bergawi told Gulf News. "Removing the head of the royal protocol in support of a journalist is a clear consolidation of the status of the media and a victory for journalism. "King Salman is again showing that no-one is above the law and that all people, officials or not, are to be held responsible for their words and deeds and for not respecting people's right to dignity." Last month, King Salman banned a senior member of the royal family, Prince Mamdouh bin Abdul Rahman, from taking part in all sports activities and speaking to the media after he made remarks considered racist during a TV talk show. The king also replaced Ahmed Al-Khatib as health minister earlier in April after he was filmed having a heated argument with a member of the public who had come to speak to him about the condition of a hospital in Riyadh.